A chewy bite of apple and cinnamon perfection! 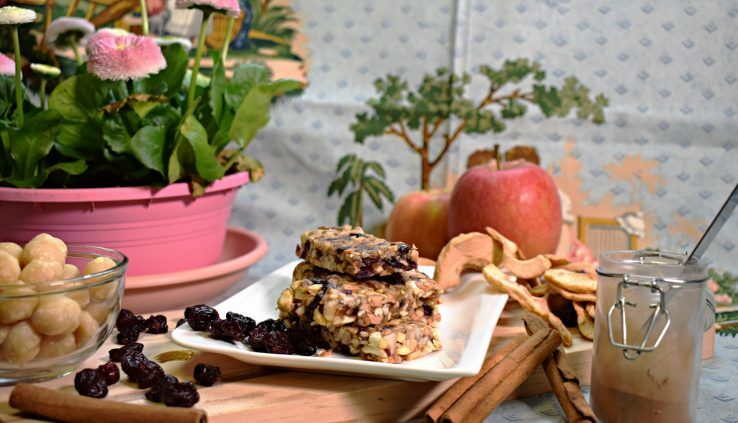 One of my favourite fruit and nut bars, this recipe packs together a fine selection of ingredients for a spectacular result. A no-bake recipe sure to please all sports, and snacking aficionados. 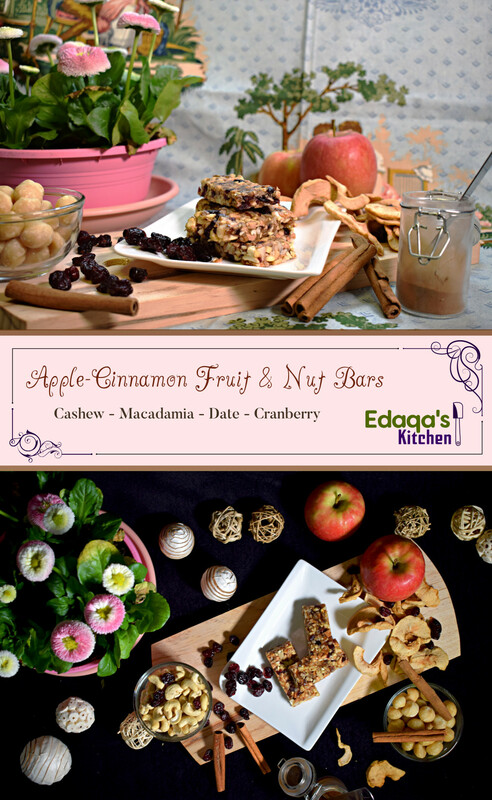 I make a lot of fruit and nut bars. While they are perfect post-workout, I admit I sometimes eat them as a snack. If you enjoy cooking shows, then check out the video class I made for this recipe. Dates are one of two common bases for fruit and nut bars. The other is figs. You can substitute one for the other, and the bars will still hold together, and be sweet. I find dates are useful when you don’t want a dominating flavour. Here I wanted the apple and cinnamon to come through. Figs have a stronger taste, suppressing other ingredients. Cashews are a soft nut, making them feel at home in a chewy bar. You could use almonds instead, but I cook so many other recipes with them. I tend to avoid them here. I hear hazelnuts work as well, but honestly, I’m not a big fan of that flavour as the base to my nut bars. I ate so many macadamia nuts last year that I find myself craving them only in small quantities now. Their hefty roasted accents create a deeper structure to the flavour. I’ve tried bars with only one nut before but discovered they lack in richness. Thus I stick with a two nut combination. I recommend trying different combinations of fruits and nuts. Chop the cashews in the food processor, or with a knife, and put them in mixing bowl. Chop the macadamia nuts in the food processor, or with a knife, and add them to the mixing bowl. Chop the dried apples with a knife and them add to the mixing bowl. Add the cinnamon and salt to the mixing bowl. Mix well. Roughly dice the dates with a knife. Make a space in the middle of them and dump in the cranberries. Chop the cranberries with the knife. Mix them together with the dates and chop them together. Set the chopped fruit aside. Slice a lemon in half and juice half of it. Add the chopped dates and cranberries to the dry mixture in the mixing bowl. Stir the mixture briefly. Pour the lemon juice into the bowl. With your hands work the mixture, kneeding and squeezing, until it clumps together. You should be able to form a ball with the mixutre. Transfer the mixture to the plastic container and pack it down roughly with your hands. Use a spoon to finish packing the mixture in the container, creating a smoother surface. Cover the container and place it in the fridge to set for about an hour. Remove the container from the fridge and remove the lid. Turn it over onto a cutting board. Tap the back of the container until the set mixture drops to the cutting board. Use a knife to slice it into bars.